Over the years, many times the question has been asked, "how should I wear my pistols, or sword?" 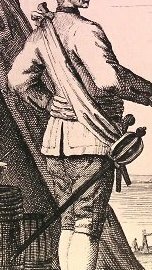 It is my hope, through the use of a few period illustrations, to suggest a few methods by which you, the pirate reenactor, might arrange his gear. First on the list is Blackbeard. Here we see Blackbeard wearing a double shoulder belt. On the belt with his monster-headed hanger he wears four pistols in holsters, and possibly two more on his left hip. We know pistol holsters existed from finds on the wreck of the Whydah. This illustration suggests they could be worn staggered on a shoulder belt, pointing downward. 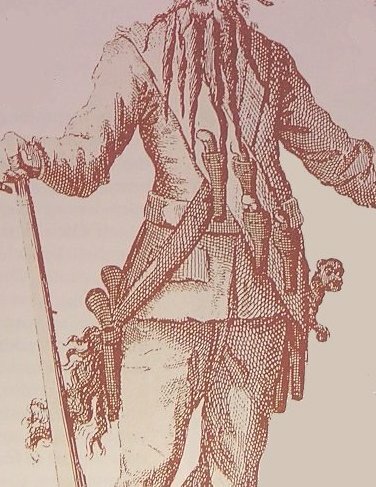 Exactly what Blackbeard is wearing at each hip in this image is subject to debate. I believe they are two brace of pistols. 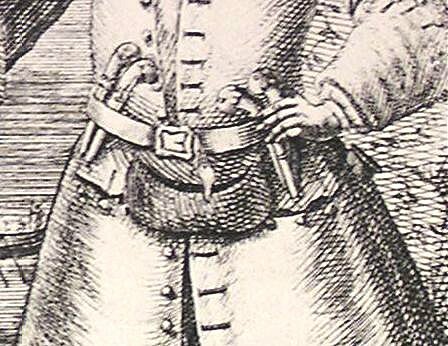 If so, the brace of pistols on his right could very well be an example of pistols worn on a "ribband". Considering the amount of tassles flowing behind him, this could be a sash of sorts made from a very wide ribbon. It is also interesting to note he wears a waist belt over his short cut sailor's jacket, with apparently nothing attached to it. I would suggest the pistols on his left hip are actually attached to the shoulder belt, and the hanger is attached to the waist belt with a frog. Next we have Captain Every. Every wears a simple waist belt, worn over his coat. A sword can be seen on his left hip, probably attached to the waistbelt by way of a single frog. Suspended from the front of the belt is a cartridge box, which appears similar in size and shape to that recovered from the Whydah. Thrust into his belt are two brace of pistols. The pistols under his left hand may be on belthooks, however, his hand obscures any details. The pistols on his right hip are thrust under the belt, a precarious method, as pistols are wont to slip from under the belt when running. However, it may be noted that captains don't need to run (that's what common pirates are for). Captain Low provides us with out first good glimpse of a sword worn on a belt attached to a single frog. The scabbard locket is plainly visible. 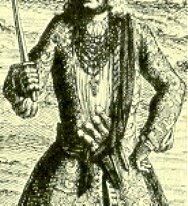 Whether scabbard lockets have been recovered from the Whydah I do not know, but I imagine they have, since this the common method by which a sword is worn during our period. The frog may have stitching running just inside of the edge, something seen on French accoutrement belts of the period. Or, it may be something elaborately covered in cloth. From this image one can only guess. Around his waist, under his coat, he also appears to wear a sash into which are tucked a brace of pistols. He seems to not have a cartridge box. 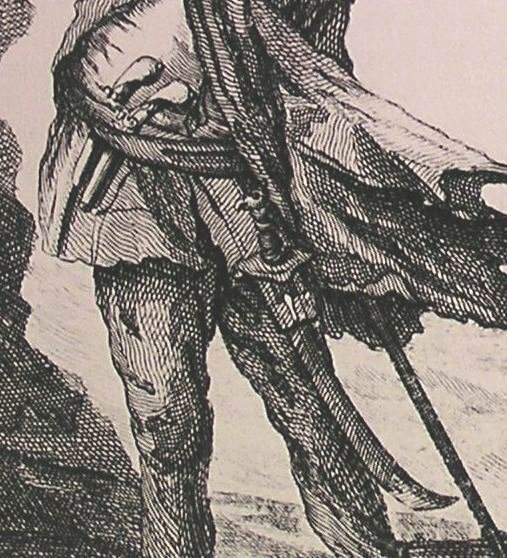 Captain Lowther wears an interesting combination of shoulder sash and waist sash, while sporting a basket-hilted sword from his right hip, with what appears to be a pair of pistols just forward of the sword. The method by which any of these is suspended from the sashes cannot be determined with any accuracy. It seems unlikely, considering the point at which the shoulder sash meets the basket hilt that the sword is attached thereon. It may be the artist's error. (And with any of these, the caveat exists that these are all artists' interpretations.) It is feasible the sword could be hanging from a waist belt, hidden from view by the sash. Or not. The pistols could be tied to the shoulder sash, in which case, if this is two pistols, I could expect there to be two sashes. 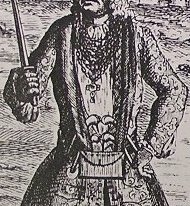 Mary Read, here shown as the epitome of the common pirate, wears what is probably the epitome of pirate kit. She wears a shoulder belt, which shows evidence of stitching along the inside (cf. Captain Low above). From this is suspended a double frog, allowing her to carry an axe, very useful in boarding both as a weapon and a tool, as well as a sword. Onto the belt are sewn two holsters, looking very much like the Whydah holster. 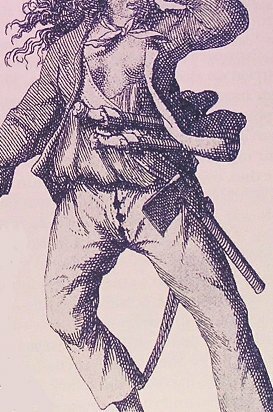 Note the almost horizontal angle, which may be an artistic convention lending Mary the illusion of movement, or possibly the artist thought this to be a more ergonomic design compared to the downward pointing pistols of Blackbeard. Roberts, here from two different editions of Captain Johnson's book On the left, which I believe to be the earlier of the two, Roberts wears two brace of pistols. While it is difficult to say for sure from this image, the last pistols may be in some sort of holster. He appears to not be wearing a waist belt, so if this is a holster (which seems unlikely to me) it must be sewn to the sash. One suggestion is that these pistols are all held to the sash by way of belt hooks. Though I would be so bold as to suggest that this could be an example of multiple pistols worn on multiple "ribbands." In the image on the right, someone has removed the four pistols and replaced them with four pistols and a cartridge box, all of which to my eye seem more crudely drawn. How this particular arrangement might fare in combat is worthy of debate. 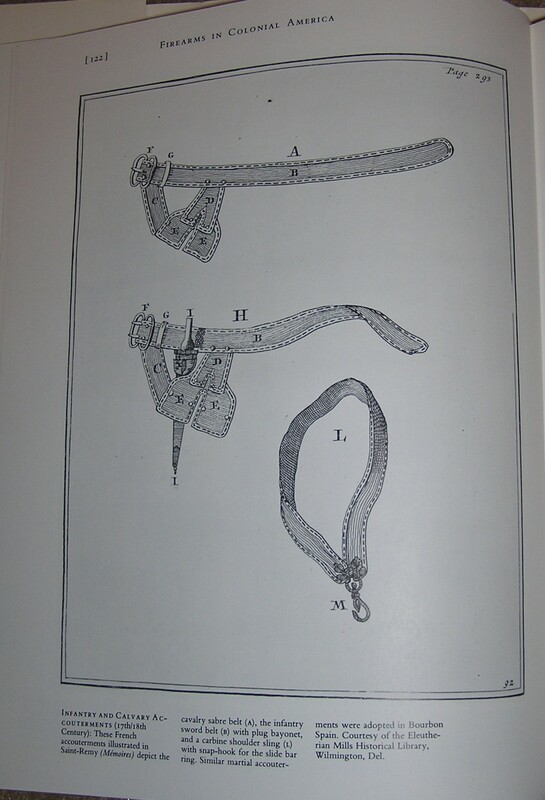 This author believes such a contraption to be unlikely, as any movement would cause the pistols and box to sway. As a final note, I know more period illustrations exist. As I find more, I may add more observations here.